100% SATISFACTION GUARANTEE: If you've already purchased a Computa Pranksta from me and need expert support, PLEASE CONTACT ME VIA EMAIL FIRST so I can help you out before you consider leaving a negative review. I'll help you, I promise! Furthermore, the difference between a 3.99 and 4.01 star rating on Amazon is roughly 200% or more in sales! Please consider carefully if you're thinking about leaving less than 4 stars. Again if you have any problems with or questions about the product PLEASE EMAIL ME DIRECTLY and let me help you first! Computa Pranksta Mouse Jiggler now available on Amazon! Click link above or image below to go to Amazon and purchase. Also available now on Ebay! See my listing, as Ebay seller "electricrcaircraftguy", here. Note: my Ebay prices are slightly LOWER because I ship them directly. -20170717 - added YouTube video: "How to Use & Configure..."
-20170422 - now available for sale on Amazon! Purchase links added. 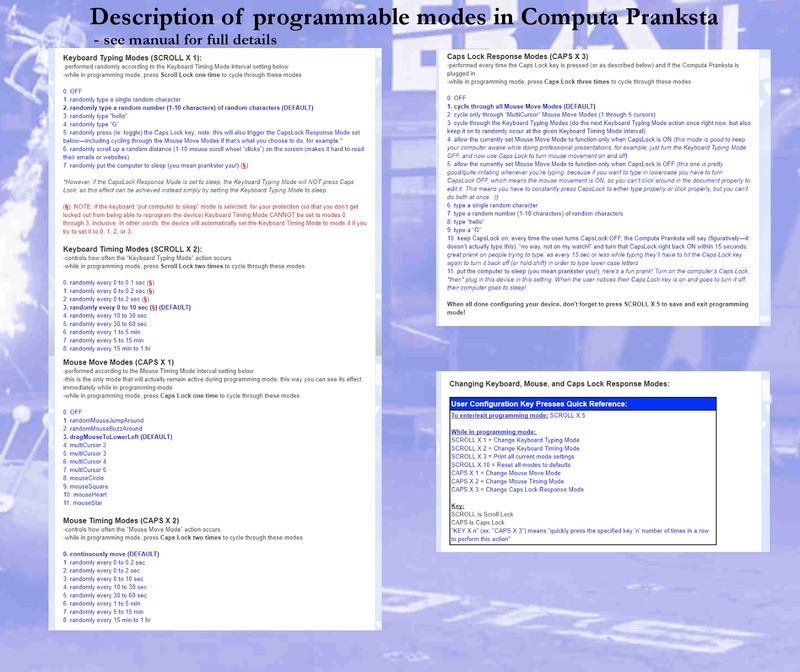 Congratulations on your purchase of the Computa Pranksta USB Mouse and Keyboard device. Don't have one yet? Click the link above to purchase it on Amazon. This device is great for playing tricks on your friends, or just for keeping your computer awake when giving presentations, watching movies, playing certain video games (like Real Flight RC simulator) or when you don't have admin rights to change screensaver and screen lock settings. This devices does NOT require any software or special drivers on your PC. It simply tells the computer it is a standard Human Interface Device mouse and keyboard. If your computer tries to detect a new device and install a driver, don't worry about it--even if it says it "fails." The device will work anyway.